Was Blade Runner Right All Along? I grew up with a very fixed idea of what the future looked like, architecturally speaking. Off-world it would be ‘2001’, at home it would be ‘The Jetsons’. What I failed to appreciate was that the future would not eradicate the past and be less ‘Tomorrowland’, more ‘Blade Runner’. I’d seen something similar in the first Tim Burton ‘Batman’. Its designer, Anton Furst, once explained to me how the future should look. Rolling out an immense plan of Gotham City, he showed me how the futuristic world had grown on top of the old one because ‘the rich always want more light’. So if you lived at the base you were half in darkness, cramped and trapped, but if you were clever you could make the best of it. This is, in a word, Tokyo; a series of mysterious boxes, one inside the other, that suggests the future will simply grow up and around what already exists. And just because one era is butted up against another, it doesn’t mean that the whole is incompatible. Tokyo suburbs can feel untouched, although the centre shows that neon and steel will eventually supplant everything else. It’s something most written SF got wrong too. ‘Fahrenheit 451’ feels firmly set in the 1950s just as Joe Haldeman’s SF soldier sagas reflect the 1970s. But the future will be a more exaggerated version of the present, polymorphous, polyglot, poly-everything. 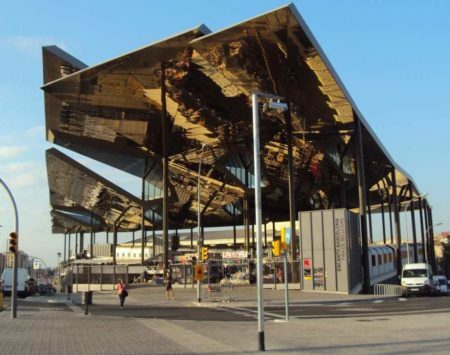 Some examples: In Barcelona a 14th century market called Encants Vells, or the Mercat de Bellcaire, got an extreme futurist makeover, with cantilevered walkways under a glistening metal roof that plays tricks with sunlight. 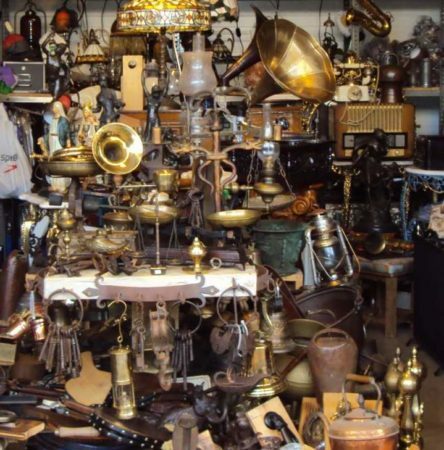 Yet its interior, which needed to entice passers-by into shopping for bric-a-brac and antiques, is completely hidden from the road, and manages to be as traditional as it gets. It’s a very neat trick that combines two worlds. In London, the Square Mile of the old financial city is being swallowed up by glass boxes, but many have been forced to keep to the traditional layout of alleyways and courtyards. The problem is that the old and new styles do not complement each other, because developers have been allowed to trample history flat. In London, money is king and it doesn’t matter if everyone else is shoved out. The contrast with other European cities is striking; Much of Italy and France has been disfigured by random blocks of futuristic nothingness, the most shocking being the grotesque rebuilding of Les Halles in Paris. In some ways protected towns have suffered the worst. In Luca and Rome, the ground floors of old buildings are stuffed with high-end trash shops that accidentally remove all trace of heritage. In Spain the residents are largely in control. Whenever a new park or market opens in Barcelona (a surprisingly frequent event) it caters to its barrio, less to big business, which is carefully managed. Here’s another example of the future touching the past. 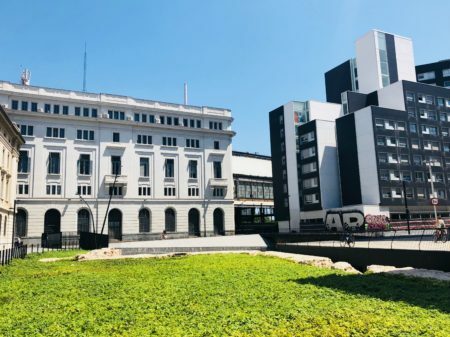 Sandwiched between 19th century buildings and modernist housing is a century-old railway terminal, so that three distinct eras are revealed in a backstreet. And if we haven’t quite managed jetpacks and floating cafés we do have hoverboards and futurism nestling nicely beside the refitted buildings of the past. But the future must be managed with intelligence and not allowed to build itself. The urban landscape is so often a palimpsest worth exploring, I love to turn a corner and find something that sticks out by being 300 years older or newer than its surroundings. So many visions of the future assume everything will be flattened and replaced or just be the old repurposed but that is rare in reality. It’s just as bad in Manchester we’ve got a new block bigger and better, it will over 200m so bigger than the current champ the Beetham Tower, the new one is part the Deansgate Square AKA Owen Street Tower A (the other 3 towers will be smaller but all of them are ugly blocks). Another in the pipeline at 213m is Trinity Tower X (again the tallest of a cluster of 5 building X to Z.) this due to be built now the Ordsall Chord has been finished. The Chord is a train track, (A link between Victoria, Piccadilly and Oxford Road stations). It’s bad when a train track not only has a better name but a better architectural feature, the bridge across the Irwell is an asymmetrical network arch bridge (1st in the UK) it has an orange/rust swish of an arch. I’ve just been reading about The Undershaft, it’ll spoil the view of The Gherkin. The idea of a total replacement was always wrong, a mix of old, new & adapted is what has should happen, although China seems to be using a blank canvas in some parts of the country and the destruction of the old is a shame. Not sure if you can manage the future buildings, there seems very little ground where those want to improve the world by smashing the past and those who want to fossilise it meet. to few seem to want to mix the two & adapt the old. Time seems to be the best planner, it tends to weed out a lot of the worst building, those badly built will collapse, but we can’t be trusted. After reading your comment I took a look at this Undershaft behemoth in construction and it is (yet) another of the wave of monster skyscrapers London has developed since about 2000. Interesting name they have chosen here though. ” Undershaft” has probably been inspired by its location close by St Andrews Undershaft the 12C church (not now in its original medieval constructed form ) which gained its odd name after being named for the Maypole which was erected at a fixed site opposite the church each year. I used to find it odd that the Gherkin which is one of the more loved super skyscrapers was pretty close to the site of this Maypole but this new even larger model is closer still. Not far at all from the probably early or perhaps even pre medieval maypole. St Andrews Undershaft and it’s new namesake are part of St Mary Axe. Each year in early May St Andrews church is beautifully decorated with spring flowers in memory of the spring rites which were celebrated at the nearby Maypole for centuries. I spent ages looking around there for a replica of part of this Maypole which was displayed in a covered alley nearby. It’s was displayed horizontally (in case you were wondering how it was displayed in a covered alley) on top of a set of stairs there – a bit like a gaudy striped stair rail. I discovered later the ruddy thing had been removed. I spent ages looking for it. St Andrews used to have a really beautiful very large stained glass window. The church was exceptional in surviving both the great fire of London and the Blitz unscathed. The window was however destroyed by the Baltic Exchange bomb in 1992. The maypole from which St Andrews derived it’s name was destroyed in 1547. The spring celebrations had become more riotous than the City could cope with and were stopped in 1517 I think. The apprentices who were the main celebrants of the spring festival destroyed the Maypole as a pagan idol. Earlier this year my family went to the Sky Garden London’s highest new public garden at – I think – 20 Fenchurch Street. Was a lovely place + we had a meal @ one of the restaurants there to celebrate the nephews birthday. What couldn’t be missed though was that the place was surrounded by a small group of mega structures all in various stages of development. In the end tourists will be happily waving at each other from the top of the various attractions at the summit of these buildings. Viewing platforms, coffee shops, bars and gardens. Is all this new office space even required? Ancient sight lines which had existed in London for centuries have been discarded in about twenty years. The City is bad enough but Victoria is worse. Quite apart from this London stuff I couldn’t say I was much of a fan of what was happening in Manchester. Parts of it were stunning, really improved. That rail link is great and parts of the city the student quarter near Oxford Road I thought was wonderful. Was lively and interesting. They were discussing that rail link for donkeys years when I left town (40 years back) they were working up to it! I went to the pictures in the old Print building think it’s off of Deansgate but not sure. M/cr is so changed now my grasp on its geography has gone! The interior of the building seemed to be done in some sort of faux mid 20C industrial style. Think the industrial heritage of the place was being celebrated. But it just never worked looked like it had all been copied from Las Vegas or Disneyland. If that big fan thing up near the roof was genuine than you have my genuine apologies but no it was all fakery surely? Unless they have truly pulled off the amazing feat of making the genuine appear faked. Bloody strange that whole place. The canal side walks were smashing though. All over toward Trafford park is amazingly changed. Media City is great. I really want to do the trip on the Manchester Ship to Liverpool I have pulled off the amazing feat of becoming a tourist in my home city! Got a right surprise at the revamped Irlam Station to see cycle routes for visitors up the Moss! Couldn’t get over that. People hardly ever went up the Moss who lived in Irlam + Cadishead all their lives. I suppose it’s all facets of being part of a tourist and visitor based economy. The way we celebrate places + exploit their heritage has massively changed. Saying all that though I thought overall the development in Manchester and Salford was piecemeal and unstructured. Looking at the long term development starting at Salford Quays putting the first wave of residential development in. (Getting half the cast of Coronation street to live there)There was it seems at that point a long term planning aim for the old docks. The new transport + gradual transformation of poor housing. Since then there seems to have been an awful lot of get rich quick schemes that have been approved. Great + not so great. Looking at pictures of it the new building I think more of an old golfing Pringle jumper than a trellis. As to Manchester I agree, in the 80’s the city was all but dead, the regeneration has been good especially to the North where Manchester City’s ground is (the site of the old coal mine that closed in the late 60’s, it crossed the Bradford fault) and the velodrome. The Salford Docks is a big improvement, I should be going to the pictures there to see The Incredibles 2 with the little one. I do like to act as a tourist every so often in the city. Manchester is always throwing up buildings and tearing down the old, it’s part of the history and is very piecemeal as you say. A place that shows this in grim detail is at the top of the old Leaf Street, a lovely old Victorian building was demolished, a building was being built and still stands as a concrete skeleton, its where Princess Road as it meets the Mancunian Way flyover and Medlock Street. The Printworks is an odd place, it’s the old Daily Mirror site on Withy Grove and Corporation Street (next road over from Deansgate). So many buildings have just disappeared Wayne it threw me out. They have done pretty much the same up @ Kings X without the IRA destabilizing lots of buildings and their foundations as a sort of kick start to the project. Mr F reckons they have spent a good few bob up around the X. Manchester must have cost a fortune to change. Remembering Manchester pre Arndale centre it’s IS better off without the place the whole shape of the city has been changed. I can remember the Mirror building. One last question was that great fan high up in the place actually REAL? Re The Undershaft I know a guy who is a City of London Tourist guide and he reckons now that if one of these super-duper skyscrapers does not achieve I THINK 65% occupancy within again I think it’s about 6 or 7 years they can apply to tear it down and start over from scratch. This is the likely fate of the “Cheesegrater” That’s unreal it’s become like Las Vegas where real estate is now so valuable the whole place is in a constant state of flux – demolishing and rebuilding itself. Lots of Manhattan’s pretty much the same. Except this is the City of London populated by the Romans. The same place the Anglo Saxons felt to be so haunted by Roman ghosts they were frightened to live there and moved to its West. The Aldwych “old village” being part of their space. This can’t be bloody right. I know extensive pre industrial archeology was found in Manchester at the time of its rebuilds but hopefully two major rebuilds will see it through the 21C. This shortened cycle of demolition to rebuild will obliterate anything that remains irretrievably. I dunno perhaps I am over reacting but it feels very wrong to me what’s happening in the Square mile. The same square mile where Ludgate hill probably housed a stone circle a thousand or more years before the first St Paul’s cathedral. Where there’s some evidence of a Tan Hill – a hill where Sun worship took place not far from Ludgate. The absolutely massive civil engineering projects of our time Crossrail 1 (shortly to be followed by Crossrail 2 ) and this gobsmacking rebuilding of London’s major sewers have been spot on with their allocated archeological research times + have even extended more time to the archeologists. This new sewer project will actually change the embankment extending it out into the Thames. It will also change the polluted state of the Thames tributaries primarily the River Lea and the tributaries tributary streams Pyms brook up in Tottenham for example. The vast scale of these civil engineering projects is incredible. It’s wonderful what they are up to. This is vital, absolutely necessary work – but this constant (‘re) building? Just creating Moneyboxes for the international investor whether residential or commercial. Of course, it’s barmy. We see it on a lesser scale. Perfectly good houses are torn down to build a bigger fancier one to sell for $2M or more. The affordable 3 story walkup apartments are all being torn down to put gigantic apartment towers in their place. That would be fine if the working people who lived in the old apartments (built in the 1960s) could afford to move into the towers, but they can’t. We’ve learned a new word -renoviction- where owners evict tenants so the building can be renovated but then tear it down. Part of it has to do with the building industry (pointed up in Hall of Mirrors) where there are too many companies chasing too few job sites. The workers need work so the companies chase contracts. The local council has just opened some new co-op housing which is aimed at those earning $80 to $125 thousand a year. As an “overpaid, underworked” teacher I never made $80 thousand in my life and I don’t think today’s teachers do either. It’s shocking to think that a reasonably well paid professional comes under the heading of supported housing. They talked about aiding people buying apartments in the Olympic housing project if they were Vancouver service people: teachers, nurses, fire and police, so that they didn’t have to move out the valley and have two hour commutes since we don’t have any rapid transit out there. That rotating build, fail to sell or rent, tear down and start again is the most revolting thing going. It is devastating to the environment and ruinous to the economy. But we’ll save ourselves if we give up plastic drinking straws. And plastic bags. Sorry Jan, I don’t know if the fan is real. The boxes we really don’t need here but it’s getting to the point where things are getting to breaking point. Well a down side of our rail plans is that may have cut part of the track out of the Manchester Science & Industry Museum track so the steam train, a copy of on of the original trains won’t run very far, if at all. At least they kept the Stevenson bridge and cleaned it up and it’s now visible for the 1st time in 150 years, but some bridges were demolished, at least the main stations are connected so should improve the rail connect. sorry my comment was suddenly cut short, I never had the chance to check the writing or finish the comment. The train is a Planet a replica of a Stephenson original. The track has been shortened & means it’s no longer linked to the main railway, so Liverpool St Station is no longer linked to the network. I always thought the Museum should have made more of the fact it’s the oldest passenger train station in the world. The rail connection across Manchester.. I guess that is a hint, so I will end it there. This is the very beginning of rail transport and is vitally important. If you *want* tourists you make the most of it and people like my husband will make tracks (only metaphorically I’m afraid) to see it. On the other hand, if you don’t want tourists then bury the whole thing. Eventually someone will unearth it and make a big thing of it. A priest came to Irlam (my hometown) a good few years ago and requested that one of his parishioners – my dad’s best mate Jimmy and dad took him up on the moss. Well just Jim really but Jim wanted protection. You don’t want to everyone to spot you out with a priest it’s like being God’s grass. So these two gents in their early seventies plus an anxious priest. Cos it was raining and he thought he would sink apparently. (Like he should worry. )make their way up the Moss all the way up to the Manchester- Liverpool rail link. This man of God then goes into overdrive almost worshipful mode. Big big railway fan first rail link between two cities he reckoned. Dad and Jim not quite certain what they were supposed to be looking at or for in the first off played along. Interesting though. One of the first rail fatalities up near Eccles on the day they opened that railway . The local MP. it was. And getting that track built across that land was something of a miracle. Great story, Jan. (God’s grass on the Moss?) But there it is, people who know, really know, and want to see. Of course he thought he’d sink, isn’t that what the rails did at first? My husband says he was obviously a ferrinchronologist. There’s a word for everything. Local people always take things for granted, especially things that developed later so even though you can’t mark or keep everything, where possible it’s good to keep beginning things. Up Irlam way is the historic Barton Aerodrome, of course renamed City Airport & Heliport because this is Manchester. Still with the splendid 30’s control tower. Like the search for train links Jan. I used to live right on the edge of Irlam and we could see over towards Barton aerodrome and the tiger moths taking off and landing. Near the Eccles overspill. What a name for a place “overspill” – dreadful really. Can picture that old control tower now. Gradually the open space between Eccles + Irlam is filling up. There was a really nice old pub at the Aerodrome- like a Berni inn. Dad and me went there one Sunday evening for a meal. Was nice meal but the place looked like a bomb had hit it. There had been a big family meal after a Christening there. I had a whinge at the manager. I have a cheek really cos my house is constantly in bomb hit it form + layout. We got the meal for free. We scarpered unable to believe our luck. Tell you what really is worth a visit Wayne that Little Woolden Moss they pick you up from Irlam Station if you are going to do a bit of work there. Your kids probably bit young for the planting! The place is amazing though now it’s so dry the Ancient timbers will have emerged from the bog and ponds. Remains of massive 5,000 year old trees. Honestly I couldn’t believe the place. Think twice about taking your own motor up there the road up to the site has been I reckon deliberately let go. Think it’s part of the old 12 yard road. Like a roller coaster I drove round the moss with mates and their youngster a few years back and it was nowhere near that bad. Wot a place though beautiful, strange every bit a match for the Norfolk broads or the Somerset levels.